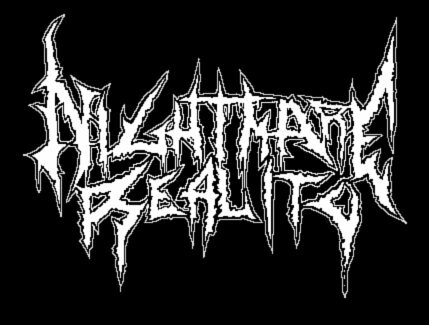 This release sounds like thrash, grind and death metal all got together and spawned the not so perfect child. 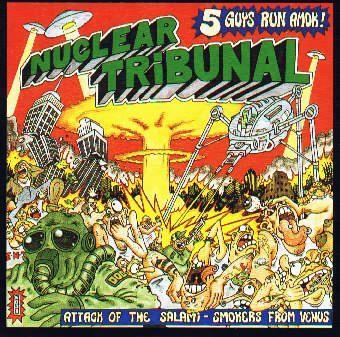 Nuclear Tribunal aren't the most known band on the block and there's fairly good reason for that. This isn't the greatest album in exsistence, but the eye catching artwork and the humour on the album alone make it pretty great and worth reviewing. I really do enjoy this album a lot but I could picture someone hearing this and asking themselves why they're listening to this garbage. "Attack of the Salami-Smokers from Venus" is definitely interesting enough to look into further. The music on the album is pretty simple deathgrind played at a mid to slower pace which does pick up often enough to create a hammering assault. The drums are mainly blast beats and just a lot of use of the high hats and snare. The bass on the album is unfortunately not very audible (I'd be surprised if you could hear it at all) and the guitars are pretty straight forward with the music. The tone is more of a crunchy thrash tone than a grindcore or death metal tone but the tempos are definitely those that you would find in death metal or grindcore. The vocals are honestly, the worst part of the album, in my opinion. The production or whatever was done to them makes it sound like the vocalist is trying to perform underwater. I bought this album off of Amazon for about four dollars (including shipping and handling) just because of the artwork. It was a random purchase that I'm not disappointed about at all. It's a fun album and I enjoy the music enough as uninspired and simple as it is. "Nuclear Tribunal (Hate Their Audience)"
"I Came to Shoot Your Dicks Off"